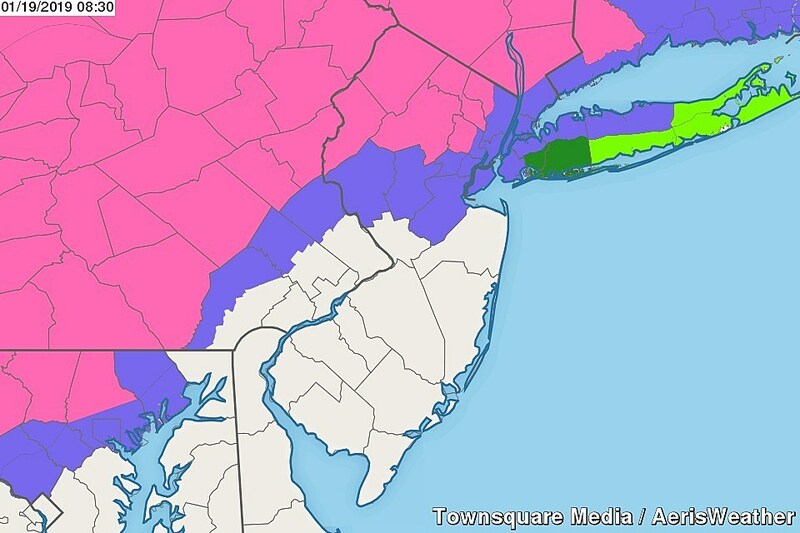 Pink=Winter Storm Warning. Purple=Winter Weather Advisory. Freezing rain is one of the most challenging weather phenomena to predict. It takes a very specific set of circumstances — an intrusion of warm air about a half-mile to a mile above the surface (called a "warm nose"), and a shallow pool of subfreezing air near the ground. Worst-case scenario? Several hours of freezing rain. 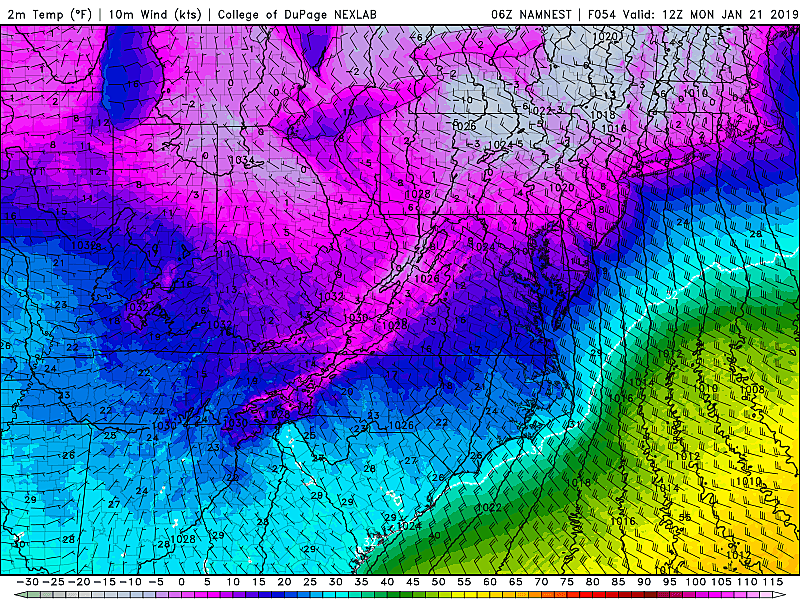 A layer of ice would be very slippery and very heavy, potentially causing impassible roads and widespread power outages. Best-case scenario? A quick hit of snow for central and northern NJ, followed by a rapid transition to all rain. Snow totals would be no more than an inch or two for the vast majority of New Jersey. Still very cold, and pretty icy too. I would take massive heat for hyping "doom and gloom" of a potential ice storm. That's OK — the potential danger here is worth that headache. Weekend winter storm update, as of Saturday morning. --Orange contour stays exactly the same, but I tweaked snow numbers down (6-12" becomes 4-8+"). All models now show the true "thumping" of snow staying north of Sussex County. I'm still leaning toward a slightly colder forecast than others have suggested, so I included the "plus" to account for over performance in this area. --Blue contour also covers the same area, but I also pushed snow totals down (3-6" becomes 2-4"). I think this better communicates the snow potential being limited to far northern New Jersey, and will much more closely match the reality of this storm. --Dark green contour, the "mostly rain zone," nudges farther north, removing most of the I-295 corridor in SW NJ. --Light green contour, the "rain zone," now firmly encompasses approximately the southern half of the state. This area may see rain, rain, rain throughout the entire storm. But my gut tells me a quick coating of snow is possible right at onset. I've never included a half-inch in a snow forecast before, but it just feels right to include the possibility here. --Saturday afternoon-evening: A quick burst of snow arrives from the west. (Probably just rain, south and coast.) Exact arrival time will depend on the location and orientation of the storm's outer edge. If anything, models have been trending toward a later "evening" start time. --Saturday night: As warmer air invades the atmosphere and temperatures rise, a transition from snow to wintry mix to rain will take place. 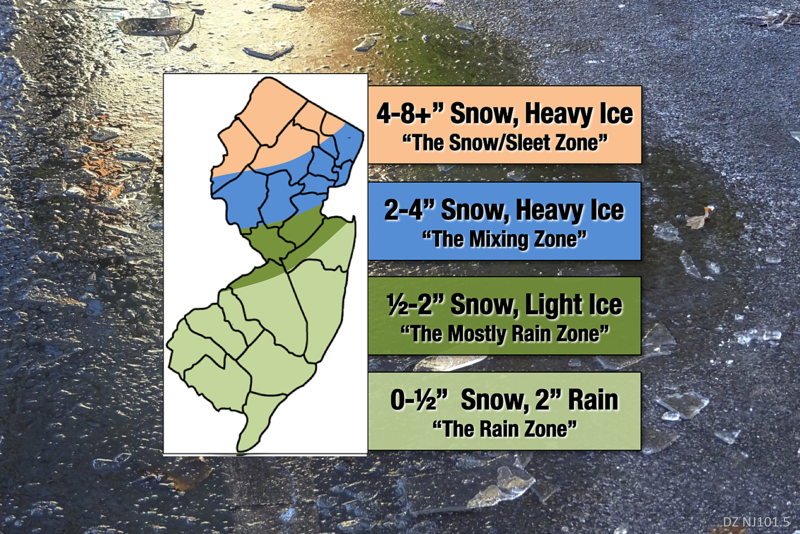 Again, North Jersey will stay snowy for a little while longer, while the southern half of the state (at least) will probably see rain for almost the entire storm. 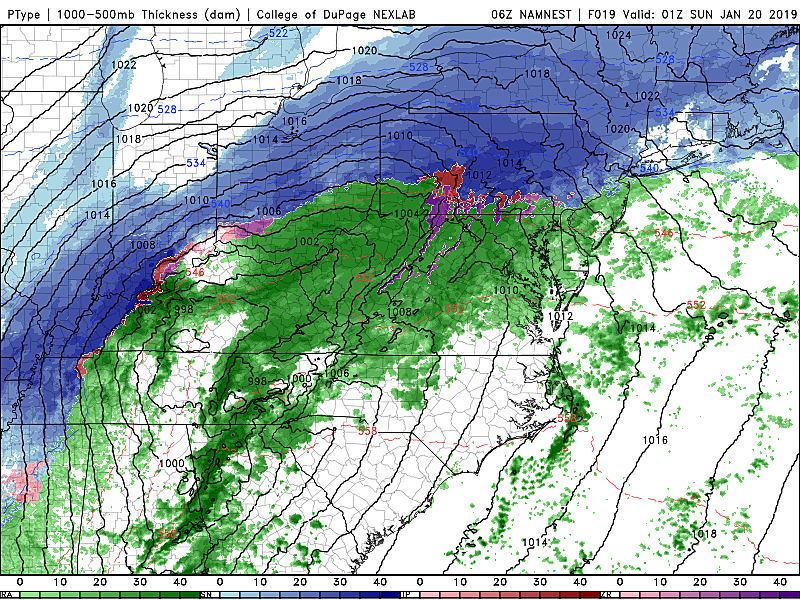 --Early Sunday morning: The "wintry mix" transition phase of the storm could bring an extended period of sleet and freezing rain to north-central NJ. --Sunday midday: A brief return to snow and/or wintry mix is possible as thermometers dip below the freezing mark. --Early Sunday afternoon: Precipitation wraps up, but gusty cooldown continues. A flash freeze is possible, as puddles and wet surfaces ice over. --Monday morning: Temperatures in the single-digits. With the wind, it'll feel like -5 to -15. --Winter Storm Warning from Noon Saturday to 6 p.m. Sunday... western Bergen, western Essex, and Passaic. --Winter Storm Warning from 1 p.m. Saturday to 4 p.m. Sunday... Morris, Sussex, and Warren. --Winter Weather Advisory from 1 p.m. Saturday to 1 p.m. Sunday... Hunterdon, Middlesex, and Somerset. --Winter Weather Advisory from 4 p.m. Saturday to 10 a.m. Sunday... eastern Bergen, eastern Essex, Hudson, and Union. --Coastal Flood Advisory from 5 a.m. to 9 a.m. Sunday... eastern Essex, Hudson, and eastern Union. As conditions are prone to go downhill rapidly Saturday evening, I offer my traditional reminder to be smart and stay safe! Our news, traffic, and weather teams are all on-duty this weekend to pass along the latest information. I'll probably bang out another weather blog update as the storm is ramping up Saturday afternoon.